Do you still need affordable fares for August 2018 and the succeeding months? 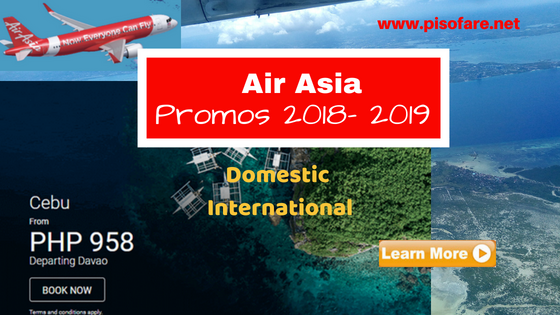 Read this new Air Asia promo fares 2018 to 2019! New Air Asia promo fares can be used for trips starting August 2018 until January 31, 2019. Booking of the promo is ongoing until August 5, 2018. Advance booking is required to avail the cheap tickets. Also, Air Asia promo tickets are not available during embargo period. Although Air Asia sale tickets are not that low, these can be considered good buys as you can use the low fares in near travel dates. As in all seat sale, Air Asia promo tickets are limited and on a First Come, First Serve basis. Promo fares depend on seat availability and may not be available on all flights. Air Asia promo fares can be used for one-way trips, but you can book for round trip ticket depending on sale ticket availability for your travel route. To get the low fares, book the Air Asia promo ticket online at www.airasia.com or purchase them at Air Asia ticket offices located in airports. Inclusion for the Air Asia low fares is 7 kilos cabin baggage, base fare, Aviation Security Fee, Domestic Passenger Service Charge and VAT. As for Air Asia international promo, only promo ticket originating from Manila cover the fare and International Passenger Service Charge. International promo flights from other airports like Cebu, Davao, Clark cover on the base fare and terminal fee to be paid at the airport prior to departure. Payment of Air Asia ticket booked online is not a problem even if you do not have a credit card. You may pay your ticket at Air Asia Payment Partners like: EC Pay, 7-Eleven, Cebuana Lhuillier, SM Store, M Lhuillier, Bayad Center, Robinson’s Store. Should you have any inquiry, please contact Air Asia hotline number: (63-2) 722 2742 from 7AM-11PM, Monday thru Sunday. LIKE our Facebook: PISO FARE TICKET to receive notification on Air Asia Red Hot Sale, Philippine Airlines Ultimate Sale, Cebu Pacific Piso Fare and other airline promos 2018 to 2019!